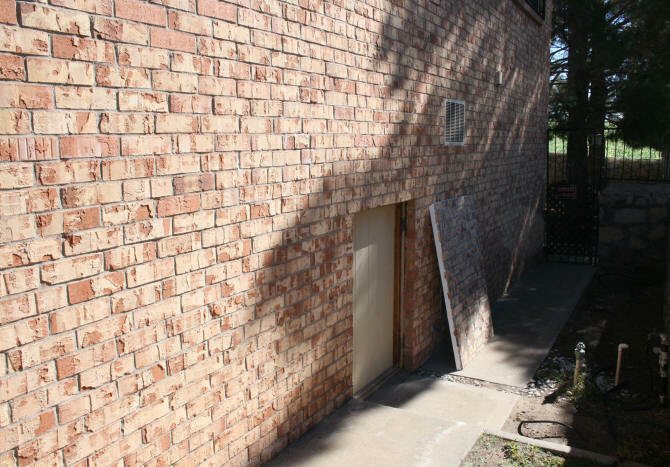 On the west side of our home is a small door that leads to the crawl space underneath the house. 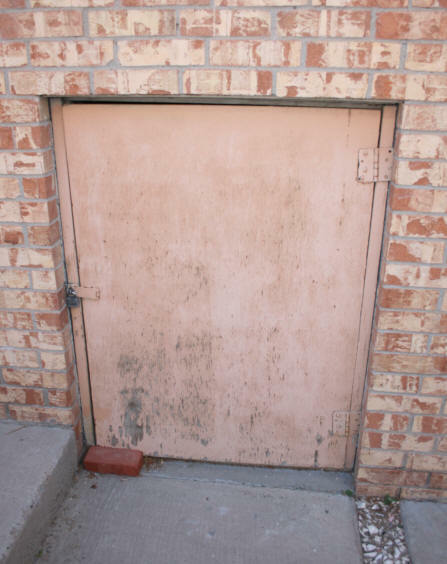 This crawl space, which could also be considered a basement of sorts, is only accessible from this outside door. The crawl space is unfinished with dirt on the ground and displays all of the pipes and the foundation for the home. It is only about 5" 6" high in some areas. So my husband and I have to hunch over when walking around down here. 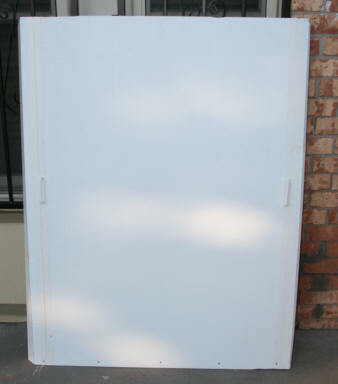 There is a lot of space for storage which is where my husband has disposed of a lot of junk over the years. Periodically I go in here and haul out junk to place in the trash or take to the citizen disposal sites in town. I also clear out cobwebs with my hair. 1) It needs to stay sheltered from the cold because of the water pipes. 2) The door needs to be secure to keep out any juvenile delinquents, burglars, or vagrants. 3) The door needs to be made invisible so that no one really notices that it exists. Which will in turn, avoid potential problems with #2 above. The door that is currently on the crawl space is warped, rotted, and ready to fall off. The door, when we bought the house, was attached to the outside of the frame with a padlock closure. The old door opens to the outside. The rain, sun, and wind all hit this door. There has been a brick at the bottom of the door that holds the bottom in place, to keep it from banging in the wind. All anyone would need to break in this door is a screw driver. Take off the accessible hinges or latch screws and you are in. A pry bar would also work and would probably be quicker. Since the crawl space door needs to be replaced, that will be tackled first. The problem with this opening is that it is not a standard size. Therefore, no standard door exists. So a custom door needs to be made. I could have done the easiest thing. Buy another piece of plywood and slap it on. But I wanted a door with some substance to it. Fortunately, I already had most of the supplies I would need. When the Raising the Roof project was completed in 2015, the contractor had some left over materials, which I kept. (Heck, I paid for it!!) Tip....watch any contractors you hire and gather their scraps. Do not let them take away a half sheet of plywood, etc. What was left was an almost full sheet of of 1/2" roof sheathing, some very long (about 20 feet) 2" x 2" wood that had been ripped from some 2" x 8" lumber. I also had a sheet of siding left over from my Siding Project. I would build the door with these materials. 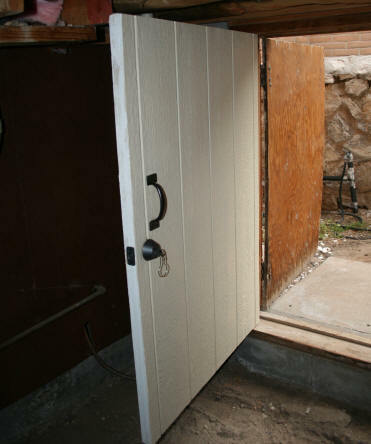 I wanted the door to open to the inside of the crawl space. This way I can put hinges on the inside and install a regular door knob or deadbolt. The door stops already existed and the wood frame was in decent shape. Measuring inside the door frame, the space measured roughly 37" x 52-5/8". So the new door needed to measure a little bit smaller to fit in the space. The size of the door would be 36-1/2" x 52-1/4". 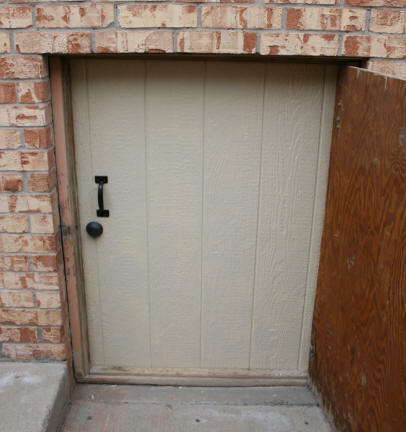 There are no photographs showing the construction of this door because I was in a hurry to just get it done and it was cold in the garage where I was working. To compensate for this, I created some graphics which are much clearer than my photographs would have been. The frame for the door was made using the scrap 2" x 2" I first needed to cut the 20 foot long pieces to a reasonable size so I could work with them. I cut two 55" pieces and two 40" pieces. I then ripped them down to a width about 3/4" wide. 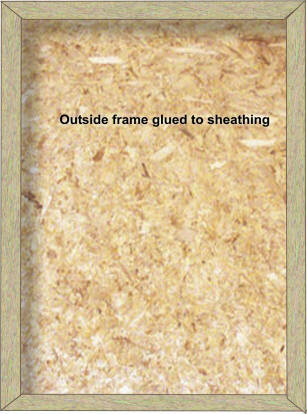 When you combine the thickness of the sheathing, the siding, and the frame. The crawl space door came out to a thickness of 1-1/2". 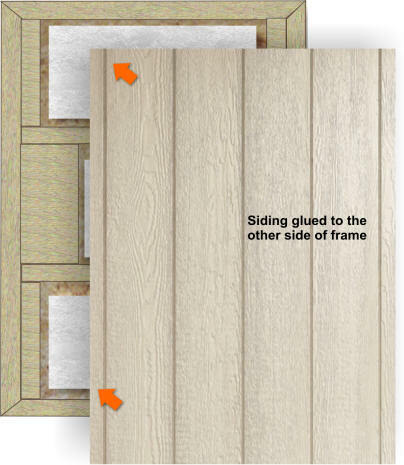 Standard doors are usually 1-3/4" thick. 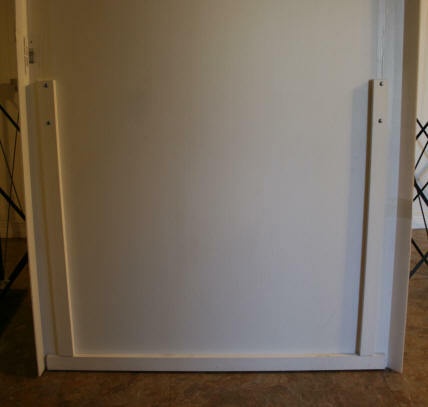 Since this door would be stronger overall than a standard door bought at a hardware store, I was not worried about being a 1/4" short of the standard. My 4 screw hinges would fit on the side of the door just fine. 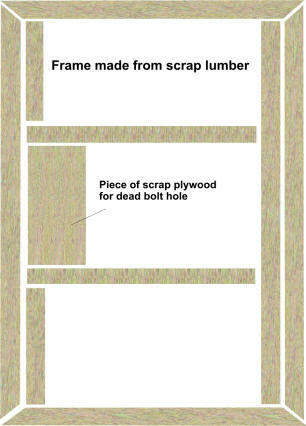 The layout of the frame used for the door is shown to the right. 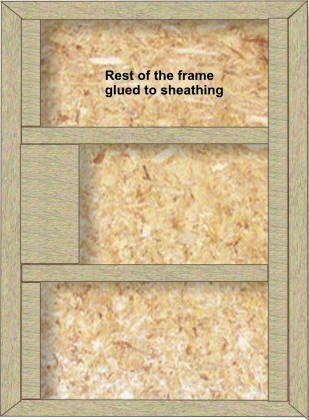 I cut the framing wood to the exact lengths I needed for the outside of the door frame. The sheathing and siding were then cut to size. I laid the piece of sheathing down, rough side up and placed the frame on. After I made sure it fit correctly, I glued the outer frame on the sheathing with wood glue. With my squaring triangle, I made sure everything was square. I then clamped everything and waited until the next day for the glue to dry. After the outer frame glue had dried, I measured and cut the wood for the rest of the frame. For the door knob/deadbolt area, I used a piece of scrap plywood. I wanted this area to be solid wood. Along the length of the door I added additional wood to make the door stronger and to allow longer hinge screws to be used, if needed later. I also added some wood going horizontally along the door. All of this to make it stronger. I then glued the rest of the frame pieces onto the sheathing. 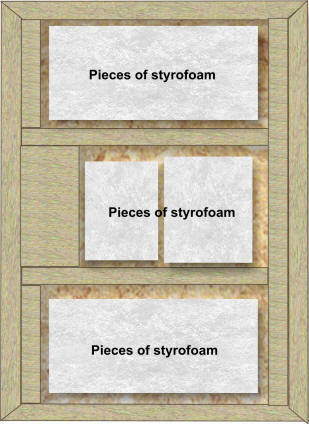 I then used some scrap pieces of styrofoam that were used for packing as additional insulation. Tip....save large pieces of styrofoam used as packing materials. I use them when I paint things and they can be used for insulation. The styrofoam did not exactly fit the area. What is there, will help keep out some of the cold and heat. It also keeps it out of the landfill. I then placed wood glue along the top of the entire frame. The siding was then carefully placed on top of the glued frame. To weigh everything down to make good contact with the glue, I placed a couple bags of cement on the door. The door was then left alone until the glue dried over night. After the glue had dried I nailed the door. I used finishing nails on the side with the siding. On the sheathing side, I used regular 1" common nails. The door was then carried to the crawl space for a fitting. This door is very heavy. I wanted a substantial door, I got it. No one will be able to kick a hole into it. The door fit fine. It was now time for some sanding. Only the edges were sanded to make sure it was smooth and level. Siding then placed on door frame with glue. 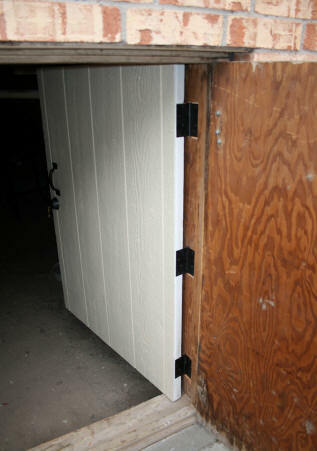 The next step was to make the hole for the deadbolt and the recesses for the door latch and hinges. 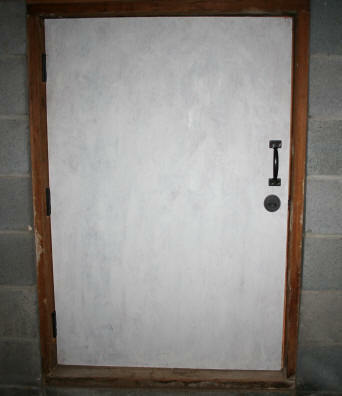 When I had worked on my house door project, I purchased doors with the knob holes already bored. So now I was stuck with the problem of making the deadbolt holes in the new door. To make it easy on myself, I purchased a door lock hole kit. Everything needed in one kit. The kit was a little pricey, but I can use it again. I put it back in the packaging after using it. This way the parts stay together and if I sell it to someone else, the kit is complete. How does it work? Great. 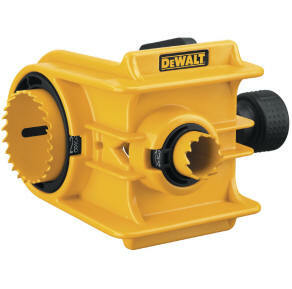 With my variable speed drill, I made the two holes quickly and easily. It took a whole lot longer to chisel out the door latch and hinge recesses. The door will have three hinges. The top and bottom hinges will be placed 5" from the top and bottom. The center hinge was placed dead center. The door was then ready for paint. The siding side and edges were painted with two coats of oil based primer. The sheathing side did not need to be painted, but I put a coat of primer on anyways. The siding side was then painted with the same beige latex paint I have used on the rest of the house exterior, after the primer had dried. The door was left to dry for a couple of days. The hardware was then installed on the door. I used a one-sided dead bolt for this door. This way there is no way someone will be locked inside the crawl space by accident or maliciously. The deadbolt is keyed with the same key used on the other doors in the house, so there will be no extra key needed. I bought some large grip handles to pull the door open or closed and installed them on both sides of the door. The deadbolt ended up on an area of the siding where there is a groove. To keep water from getting inside the lock mechanism, I sealed the top area of the lock with clear caulk. On the frame, to accommodate where the hinge would attached in the middle of the wood frame, instead of at the edge, extra wood was chiseled out so the hinge sleeves and knuckles would operate freely. I still need to sand the door frame and stop. I want to paint these areas after sanding. I will also be installing some weather stripping on the new door. In the meantime, I have left the flimsy old door on until I finish all of the frame painting and weather stripping. Weeks of cold and wet weather keep me from doing this for now. There is also the problem of the now exposed door stop and wood frame after I remove the old door. This recessed area in the brick is now even more recessed with the new door installed on the inside of the stop. The new door has solved two of the three problems I listed above. 1) The door now provides better insulation to protect the pipes and 2) is more secure to protect against break-ins. But what about making the crawl space appear invisible? What if I made a cover for the outside of this opening? Something that would lift easily out of the way to provide access to the door. 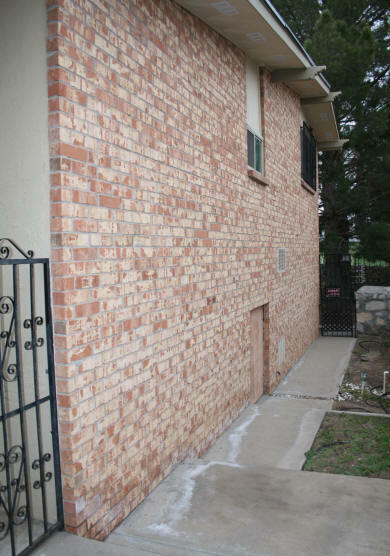 This cover could then be painted a faux brick pattern to match the existing brick. From a distance, it would appear as if there was no opening on the side of the house. This cover would also provide protection from the rain and sun. I am not sure my idea will work or how long it will last, but I am going to try it out anyways. 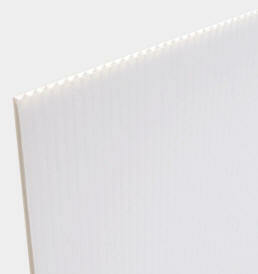 The material that I needed will have to be light but somewhat durable. The material that I am going to try to use for this project is corrugated plastic. Some hardware stores have this. I bought a sheet 3' x 6'. I do not know what I was thinking, but I actually needed a 4' x 8' sheet. However, I made it work with the 3' x 6'. The opening I need to cover on the outside of the crawl space measures 40" x 54-5/8". Based on this, you can see why I actually needed a 4' x 8' sheet. What I did was cut a piece that was 36" x 54-5/8" and then cut 4" pieces and attached them to the side with white duct tape. I made flaps on the long ends that will help hold the board in place. To make the flaps, I scored the board only half-way through and then folded it on the cut. Now the width of the board is 40" with flaps that will help hold the board in place in the opening. 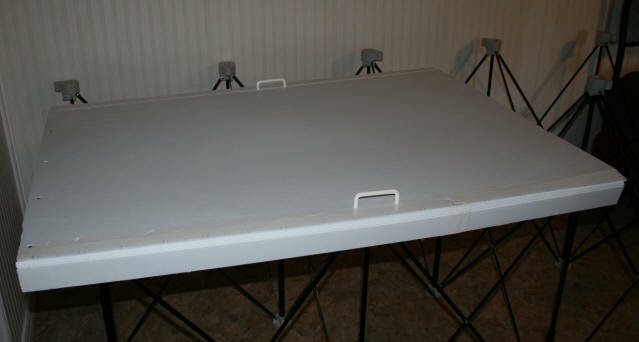 To make the board more rigid, along the bottom and side, I used some pvc trim board and screwed them on the sheet. I bought two cheap plastic handles and screwed them on through the board and pvc trim. I only used the pvc in the lower section because it is all that is really needed. I also want to keep this piece lightweight. The board was fitted in place and with an utility knife some board was shaved off to fit around uneven brick areas. After the board was fit into the crawl space opening and all the edges were tweaked to fit around the bricks of the opening, I made the markings for the faux brick and mortar. The goal is to make the board blend into the existing surrounding bricks. This means I have to paint on the exact location of where the mortar and bricks end on the real surface. Marked the board where the faux brick and mortar will be painted on. Before taping out the brick pattern, I gave the board a light sanding to roughen up the smooth surface so the spackling and paint I will be using will stick on better. 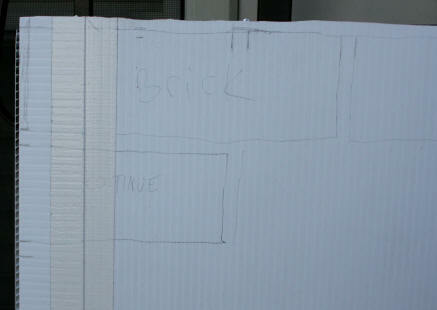 I then taped the brick pattern on. The one thing the bricks do not have at this point, is any texture. 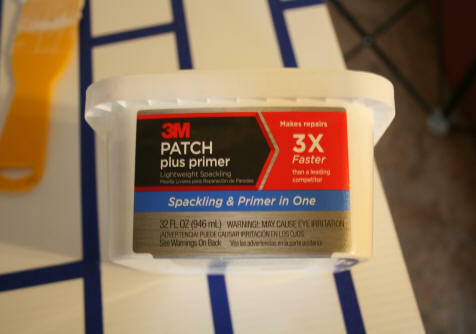 So I picked up some lightweight spackling and primer patch. Any type of spackling should do, to add texture. This is just what I found on-hand at Sherwin Williams when I was buying the brick paint. 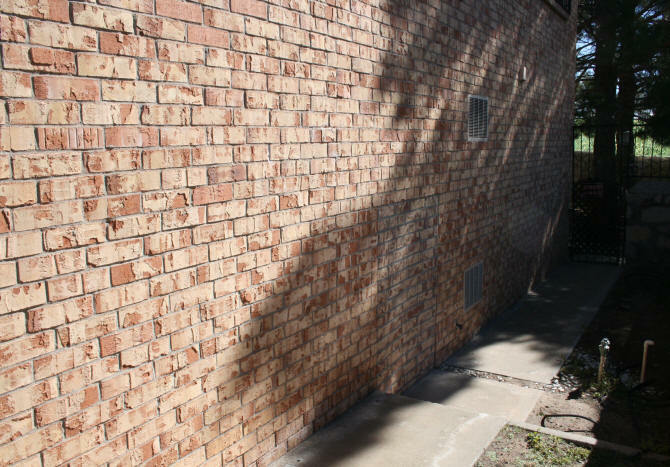 If your bricks have only a slightly rough surface, you can probably just use a spray texture and then paint. For this board, I used the entire 32 oz container of spackling. Before the spackling dried, I removed most of the masking tape. If you wait until the spackling is hard, the tape will be harder to remove and some chunks of spackling will be pulled off with the tape. The product says you can paint in an hour. In a 62 degree room, where this board was drying, there were still some areas that were not dry a few hours later. I would suggest waiting overnight for the spackling to harden completely before painting. The bricks on this house are unusual. It looks like the lighter color is paint on top of the terra cotta colored bricks. It is not. The lighter color was added on top of the brick when it was made. It is a very rough and random finish. When purchasing the paint, I took a brick with me to the paint store to match it. 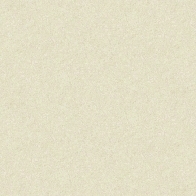 I purchased a quart of the lighter color and a quart of the darker color. I will mix the two to get the variations. 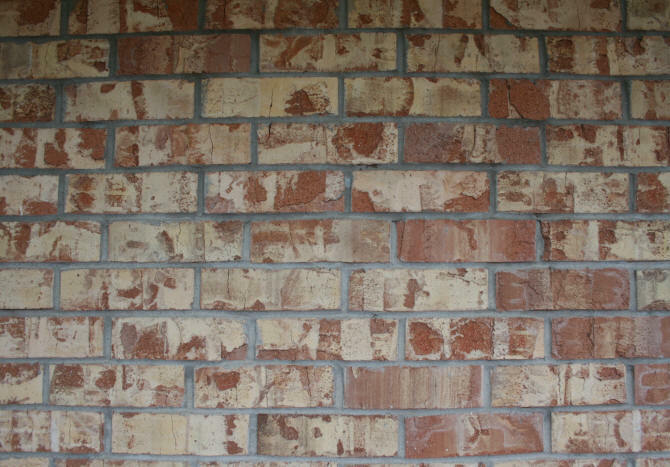 The lighter color is the dominant color when you look at a large section of the brick. 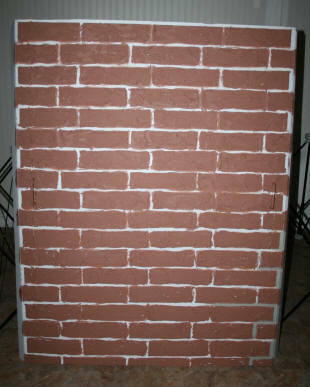 I will start with painting all the bricks the darker color and apply the lighter colors on top. The other color needed is a gray for the mortar. This color I already had on-hand. 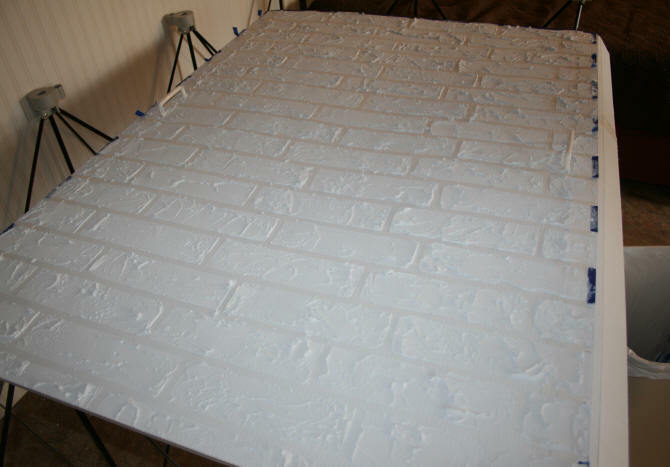 I first painted the dark brick color onto the textured bricks on the board. This step was nothing more than the task of just getting all of the bricks covered in paint. The next step with the paint is the artistic part. Painting the light color on to mimic the pattern on the existing bricks. To do this, I just looked at a particular brick from the photograph above and copied it. For the next brick, I looked at the brick next to it. I also painted some of the grey mortar. 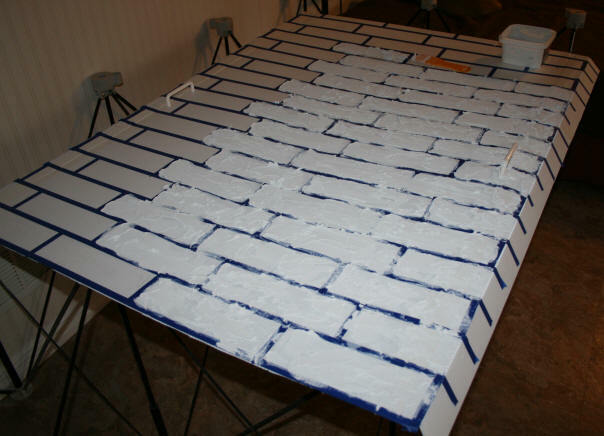 When I finished painting three bricks, I took the board outside to see how it blended in. The photos of the painted bricks above were taken when it was overcast. My paint job mimicking the brick pattern was dead-on. However, the colors are a little off. The dark color needs a little more red and the light color needs to be a little more yellow. 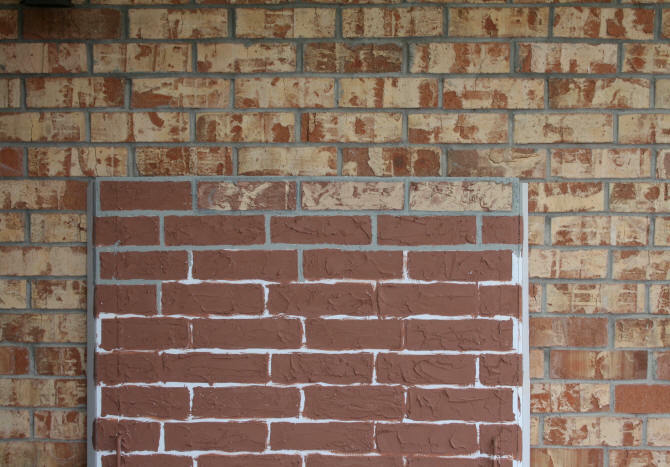 It was difficult at the paint store matching the colors to the brick I had with me. So I am not surprised I did not match the colors exactly. 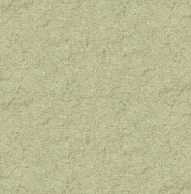 My grey mortar color is a little light. I will be mixing some black in to darken it. What I am going for is a crawl space cover that is almost invisible. When the cover is painted and put in place over the crawl space hole, no one from the street level will notice the color variation. Close-up, perhaps. I also have to take into account that the sun will fade this paint. How much and to what color it will fade to, is not known. I will continue painting the bricks with my existing colors. When the board is put in place over the crawl space hole, I will see if the colors are too noticeable. If they are, I will pick up some red and yellow paint and do a light brush wash on the surface. 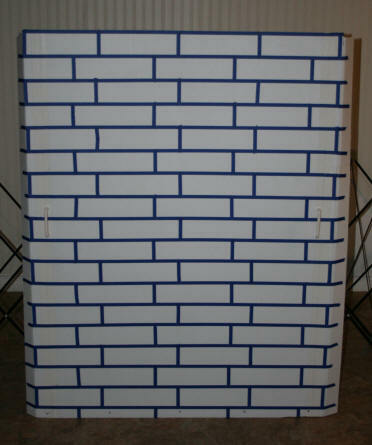 After I finished painting the faux bricks on the board it was time to put the faux brick cover in place. I removed the old warped outer door. The hole cover fits tightly in place. The flaps along the sides help hold it in place. The corrugated plastic has to be worked in along the edges. The cover is flush with the edge but could be pushed in about an inch more. To remove the cover, you just grab the handles and gently pull it out. Yes, the handles were painted also. I think it came out pretty decent looking, even though the colors are a little off. From a distance, it is hard to tell that there is an opening. Goal #3 has been accomplished, the door is now almost invisible from the street level. In fact, most people would not notice anything at all, unless it was pointed out to them. Although not water tight, the cover will keep a lot the rain, wind, and rain from hitting the new crawl space door. As for the crawl space opening, it will be sanded down, cracks sealed, and given a fresh coat of paint. This way the door frame will be weather ready in case my faux brick door cover fails. 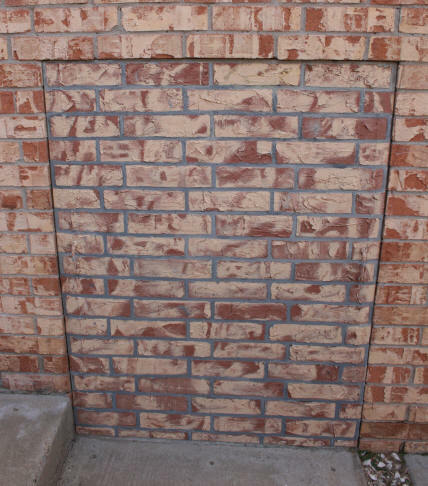 I will update this web page if I run into any problems with the faux brick door cover. If you come across this page, sometime in the future, and don't see an update here, you can assume it is still holding up fine.